$15.00 / Person - Tickets at the door! 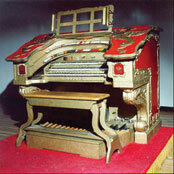 The Flint Theatre Organ Club would like to welcome you to the FTOC website. Bringing the mighty “Barton 3-11” pipe organ to public awareness has been a desire of the club. Through its concerts and silent films, many have become familiar with the Barton and the unique quality it produces. We hope you will enjoy viewing and learning about this historical instrument through this website. Be sure to visit the Events page for upcoming concerts or silent films. Since 1967, FTOC and its members have dedicated themselves to the restoration and preservation of the Barton Pipe Organ. When one can see the many panels, pipes, wires and actual instruments utilized by this instrument, a certain awe is felt for the organ, built in 1928 at Oshkosh, WI. Your appreciation for the members and enthusiasts who disassembled, moved and reassembled the organ in 1976 to its current location, The Flint Institute of Music (FIM), will be apparent when you visit the gallery. And of course our deepest appreciation to the Butterfield Theaters for donating the organ and to the FIM. It has remained in the Flint area for all to enjoy - the sound and prominence of what was a major instrument in the history of film as a one person orchestra.